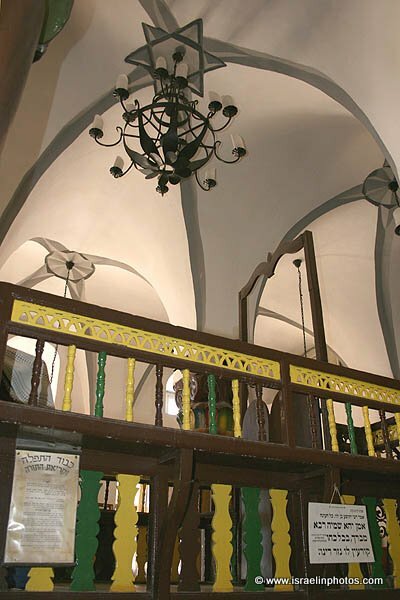 The Ashkenazi Ha’Ari Synagogue was built in the sixteenth century on the northern edge of the Sephardic neighborhood. 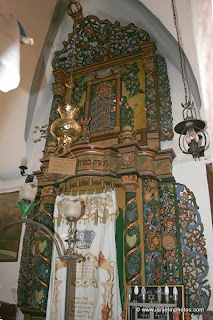 The synagogue was buiIt by Sephardic pilgrims from Greece who immigrated to Safed, nicknamed "Gergios", Gringus, prior to the arrival of Rabbi Isaac Luria (known by his acronym "Ari") to Safed at the end of the 16th century. They were devotees of the Jewish Kabbala, mostly followers of Rabbi Moshe Cordovero. In 1570 they were joined by the "Ari" (a pupil of Rabbi Moshe Cordovero). 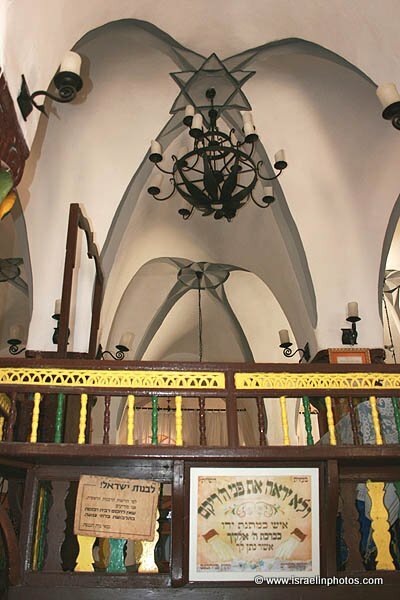 In the eighteenth century, after the arrival of the Hasidim, the synagogue served the Ashkenazi community and from then on it was called "the Ashkenazi Ha’Ari Synagogue". 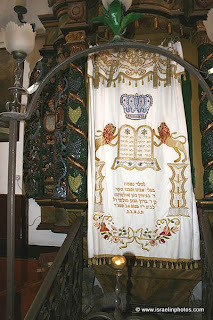 The synagogue was destroyed in the earthquake of 1837, and was rebuilt 20 years later. 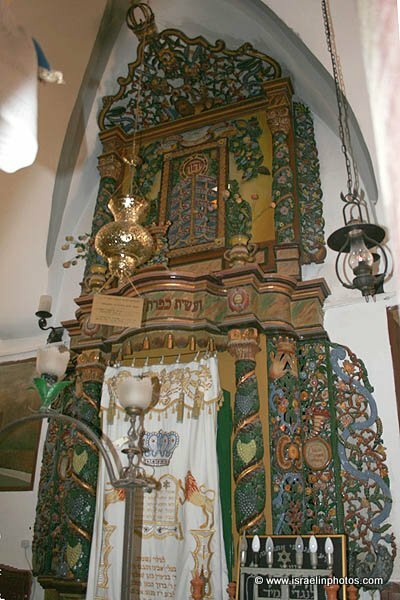 A stone inscription in Hebrew above the lintel in the entrance reads: "How awe-inspiring is this place, the synagogue of Ha’Ari of blessed memory". The Ark was carved of olive wood by a craftsman from Galicia, in the style of the synagogues of Eastern Europe and includes an anthropomorphic image of a lion, alluding to the acronym Ha’Ari, which means "The Lion". During the 1948 War a bomb fell in the courtyard, and a piece of shrapnel flew into the synagogue, while it was packed with people seeking shelter, yet miraculously no-one was hurt. This event was considered one of many miracles said that took place in Safed. 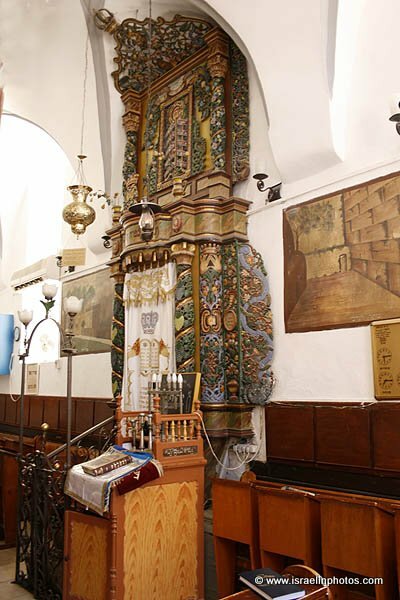 Though the synagogue is associated by name with the Ashkenazi community, it serves as a place of worship for Hasidic and Sephardic Jews and remains popular among worshippers of different affiliations. Rabbi Isaac Luria custom was to pray in the synagogue on the Eve of Sabbath, proceeding from there with his disciples to a nearby field (Hakal Tapuchin) to welcome the Sabbath. 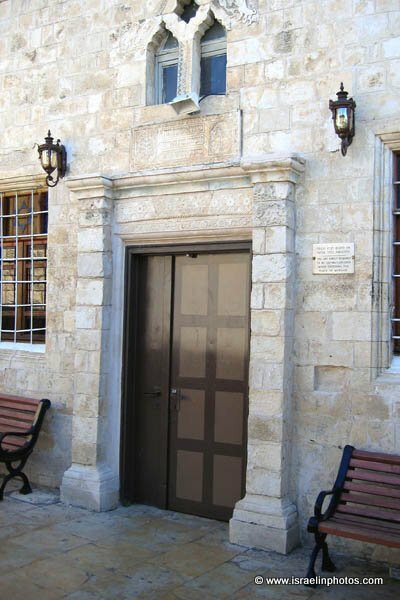 The Ari’s tradition of welcoming the Sabbath outside is still echoed in every Kabbalat Shabbat service today when, during the singing of Lecha Dodi, the worshippers turn toward the entrance of the synagogue Rabbi Moshe Cordovero born ca. 1522 to descendants of Spanish exiles from Cordova, he was ordained by Rabbi Ya’acov Beirav at the age of 13, just before Beirav fled to Damascus. Cordovero continued his studies with Rabbi Yosef Caro and Rabbi Shlomo Alkabetz. He instituted the custom of studying outdoors at ancient holy graves in the Galilee. His most famous book is Pardes Rimonim, considered one of the most important works of Kabbalah. He died in1570 and is buried in the ancient cemetery of Safed.